The Pink Tide Recedes: End of An Era? To download a PDF version of this article,click here. A political pundit is feeling overworked from all the speculating that he had to do on the weekend talk shows, so he strolls to the beach to relax. He gets there by morning, has a few drinks, takes a nap, and wakes up in the afternoon, the better part of his first vacation day having drifted by. To his astonishment, the ocean has advanced at least ten yards towards him and waves are splashing around the sides of his lawn chair. Quickly, he sends out a flurry of tweets and wires the news back to Washington, anticipating a headline in the New York Times reading “Global Warming Strikes Myrtle Beach: Ice Caps Gone Forever”. Dusk rapidly approaches as he finishes up the final draft of this Pulitzer Prize winning masterpiece. He looks back up to the ocean and sees that the waters have returned—to his renewed amazement—to where they were when he arrived in the morning. To the typical tourist, our pundit just witnessed the daily changes of the tides. But, to the pundit, something historically unprecedented happened—twice in a day no less. Our frenetic, pampered pundit could have written many of the mainstream analyses of two recent elections in South America. The BBC has gloated that the metaphorical ‘Pink Tide’ that brought left-leaning governments to Argentina, Venezuela, Brazil, Bolivia, and Ecuador has been fundamentally altered by Peronist defeats in Argentina coupled with the socialist PSUV’s parliamentary loss in Venezuela. The Wall Street Journal has stated that the Pink Tide is ebbing away. Analysts guided by sober objectivity, however, should not fabricate trends out of a mere two plot points. Without ruling out the possibility that Latin American politics are taking a sharp turn to the right, the notion that the Pink Tide is over is sensationalism at best, and an intentional campaign to dull Latin American and international resistance to the Washington Consensus at worst, neither of which constitutes responsible journalism. What mainstream reactions fail to grasp is that this political movement advocated for ideas and policies, not necessarily for the careers of the people who gave those ideas a voice. The Pink Tide rejected privatization of state services and liberalized international trade. It pushed back against the neo-liberal agenda that infected Latin American politics from the 1990s onward. It ended the dominance of the Washington Consensus, which held that shrinking government was the panacea to all of the problems of the modern world. Persistent domestic resistance from Latin American leaders and their electorates, termed the Pink Tide, finally overcame the Washington Consensus. This is just a rough description of the Pink Tide’s objectives; books will be written pinning down the specifics. In any event, Mauricio Macri’s victory over Peronist Daniel Scioli for Argentina’s presidency and the MUD alliance’s overwhelming legislative victory over the ruling PSUV in Venezuela do not mean that the Pink Tide has receded. Rather, it means that Argentinian and Venezuelan voters rejected the Pink Tide’s messengers and that the message itself might need fine-tuning. Moreover, the Pink Tide was not just about altering policies. Politicians elected during the Pink Tide epoch also sought to reframe how the state saw its citizenry, as evidenced by the innovative campaign strategies that its politicians chose to use. When Hugo Chávez ran against opposition leader Manuel Rosales in 2006, the differences in campaign strategies between the two candidates spoke volumes about the goals of the so-called Pink Tide. Rosales saw Venezuelans as nodes in a marketplace, not as people with profound and complex social needs. He saw their votes as products to be purchased, not as the embodiment of a sacred trust in the group of institutions that collectively form the state and are meant to better their lives. Rosales proposed direct access to Venezuelan oil revenues, something that 59 percent of Venezuelans opposed, by distributing personal debit cards to every Venezuelan. His proposal illustrates this warped orientation because revenues are in this view something inherently collective that should, wrongly, be individually distributed. On the other hand, Chávez opposed this form of direct access and favored channeling the oil revenues into education, healthcare, employment opportunities, and various social services. The gulf between the Rosales and Chávez stance on oil revenues can be extrapolated more deeply into a vastly divergent opinion over the proper role for the state. Pink Tide politicians roundly rejected Rosales’s position in favor of Chávez’s; not only out of an economic argument, but also out of a fundamentally social one that values people as something more than workers or consumers. In Argentina, Macri’s victory has been interpreted as the first major setback for the Pink Tide. On the contrary, it was a rejection of the strand of Peronism that Cristina Fernandez and her late husband Nestor Kirchner popularized during their three successive terms in office (COHA explored the subtle differences between traditional Peronism and Kirchnerism in “Making Peronism Work: Prospects for the Argentinian Run-Off Election”). Admittedly, the populism that Juan Peron himself promoted very much changed between his first and third (and final) terms. Then, and here once again, we cautioned that the Kirchners’ confrontational style and untenable macroeconomic policies had veered far from Juan Peron’s original policy positions, even more drastically than the conservative Argentine President Carlos Menem, and were causing a great deal of skepticism for Cristina Kirchner’s Partido Justicialista (PJ) among its traditional support base. It was apparent that without internal party reforms, there was a good chance that Scioli would lose the election, as was the case eventually. Consequently, Kirchnerist twists on Peronism -such as a penchant for abrasive and ineffective political maneuvering- seem to have temporarily cost electoral support for this particular version of populism. Crucially, this outcome is completely distinct from the mainstream view that the Pink Tide has now ended. Voters believed that this particular version of left wing populism was threatening Argentina’s democratic institutions and republican character through the attempted dominance of one branch of government over the others. Of course, as COHA has observed in previous analyses, Peronism has always had anti-democratic elements. But a combination of increased popular unease at these elements and Cristina Kirchner’s enhancement of their threat to the entire democratic system proved to be electorally damaging for her party. In Venezuela, the PSUV’s crushing defeat has been similarly misinterpreted as the second, and mortal, blow to the Pink Tide. However, PSUV’s defeat was not really meant as a referendum on their socialist ideology or even on its practical implications. Instead, it was a referendum on President Nicolas Maduro’s popularity and effectiveness, which was certainly influenced by his socialist beliefs, yet not dictated by them. Datanalisis, a well-regarded Venezuelan polling group, stated that Maduro’s approval rating was 24.3 percent in July. That rating had remained roughly constant until the December elections, even dipping slightly to 22 percent. Maduro’s personality has failed to allow him to win over Venezuelans in the same way that the charismatic and fiery Hugo Chávez did. Maduro does not trust those outside of a small inner sanctum and continuously searches for enemies, both personally and for his nation as a whole. Further, his promotion of sycophants to high positions within his cabinet has fed his paranoia, keeping him focused on a futile search for enemies rather than on a genuine search for responses to the immense challenges facing Venezuela, like goods shortages and extraordinarily high inflation. Victories for right of center candidates in Argentina and Venezuela could mean that the Pink Tide has begun to recede—but that is not the inevitable conclusion that should be drawn from these two elections. Political pundits of every political persuasion need to wait and see what happens in the coming months and even years before such a declaration can be confidently made. Both Argentina and Venezuela had leaders that cost their own political parties support in unique ways. Cristina Fernandez de Kirchner led in a way that was widely perceived to be anti-democratic. While she was elected twice in free and fair presidential elections, she had a confrontational and increasingly erratic leadership style, even refusing at the end of her term to attend president-elect Macri’s swearing in ceremony and hang a ceremonial sash upon her political rival. Maduro was unpopular because he failed to address economic issues and then blamed mostly fictitious enemies for Venezuela’s most troubling crises. Yes, there were and continue to be economic incentives for smugglers to sell Venezuelan goods in Colombia, but the economic inefficiency of the Maduro government has exacerbated pre-existing goods shortages. Because the Pink Tide is ideological, rather than personal, these two leaders’ political defeats, through the former’s inability to coronate a successor and the latter’s inability to maintain control over the legislature, does not equate to an end for the larger phenomenon. Persistent left-of-center losses in more Latin American states, would seem to indicate that electoral losses revolve around a rejection of the Pink Tide’s message. Currently, electoral losses seem to stem from a rejection of the Pink Tide’s messengers. Commentators would do well to keep this distinction in mind. And, without engaging in speculation, like our imaginary political pundit, even if the past two elections in Argentina and Venezuela were not flukes but the start of a trend that rejects left wing politics, then the Pink Tide is still likely to have long-term effects. First, the Pink Tide has reinforced certain cultural attitudes that will not recede simply because some of its main proponents have left public office. A hemisphere-wide shift has occurred in public opinion towards the United States. This shift has been many years in the making and is informed by grievous policy errors that have been committed in the name of “free-markets” and “democracy”. Rebuilding trust will be a challenge for U.S. policy-makers and will not occur instantaneously even if politicians favored inside Washington were to be elected. Secondly, the global economic environment has also changed dramatically since the Great Recession making a return to the previous era of neo-liberalism and reliance on Washington unlikely. U.S. economic hegemony in the Latin America continues to ebb away as Brazil’s economy grows—albeit this trend may be delayed by Brazil’s looming recession. Latin American states will continue to seek economic stability and reliable markets internally, since the U.S. has failed to be a source of these intangibles. Consequently, continued Latin American economic, political, and social integration—key aspects of the Pink Tide—will continue to accelerate as inter-regional trade grows. Since the formation in the early 1990s of the regional trade bloc MERCOSUR, exports to fellow Latin American member states reached 14% of the total export share by 2007. Thirdly, the Pink Tide has allowed left-leaning ideologues to gain influence within bureaucracies, media companies, and judiciaries throughout Latin America. So, it will require consistent electoral defeats before leftist political influence, which allowed the Pink Tide’s policies to occur, would be completely eradicated. It is doubtful that the Pink Tide’s policy implications will fade away anytime soon. Bolivarian President Evo Morales loses his upcoming referendum in February that would allow him to run for a fourth presidential term. Brazilian President Dilma Rousseff, ensnared in investigations of the state-owned Petroleo Brasileiro, may well be impeached. Nevertheless, the Pink Tide’s influence seems to be here to stay. 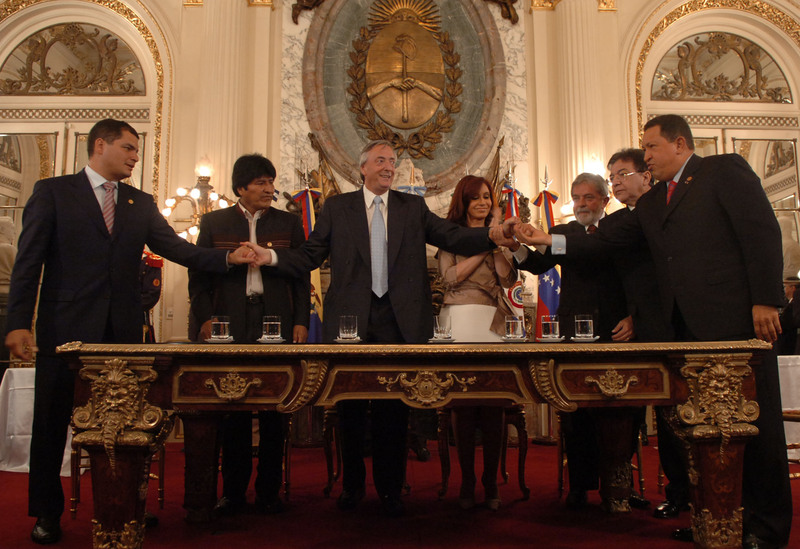 The Pink Tide has fundamentally altered the relationship between Latin American governments and their people, and among Latin American states. For the time being, a few elections in which leftist candidates and leftist parties were defeated, in some cases decisively, should not be taken as evidence that this broad and deep political shift is on the cusp of being reversed. Please accept this article as a free contribution from COHA, but if re-posting, please afford authorial and institutional attribution. Exclusive rights can be negotiated. For additional news and analysis on Latin America, please go to: LatinNews.com and Rights Action. Temporary-Protected Status: Does Guatemala Deserve It?